Is it just me, or is the world a bit ‘tech’ crazy? Everything is specially designed, from technical fabrics to suit specific environments and for the best tailoring. All terrific but what about the basics? The Wilderness Wear company has been treading the line between innovative design and traditional application since 1989. The company produces a range of technical outdoor clothing, refining and developing items from season to season, and being equally dedicated and adept at innovation. Wilderness Wear is an Aussie company, using Australian raw materials, manufactured in Australia (once there 200% Australian owned and manufactured labelling) and we all like to support home grown. 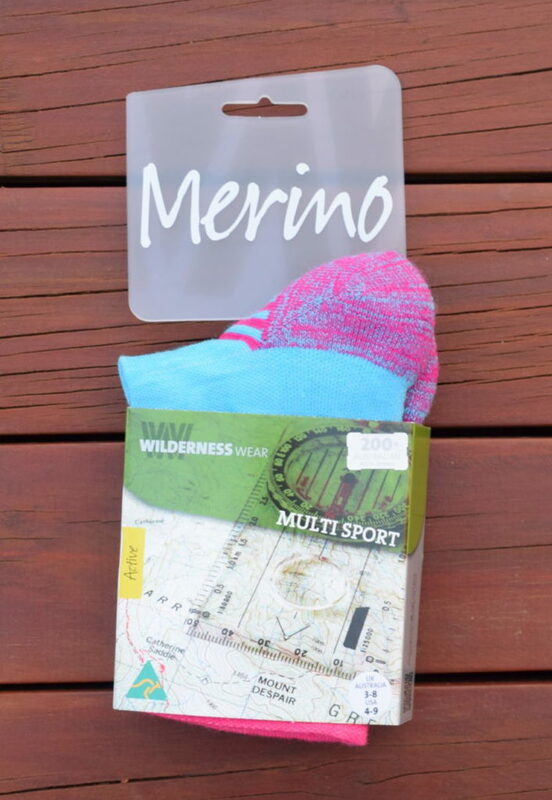 The Wilderness Wear Multi Sport Active Sock is no exception. These socks are made from 80% Australian wool from sheep bred in Tasmania with a focus on quality and sustainability, and avoiding chemical pollutants during the fibre treatment process. The socks do contain 10% Nylon and 10% Lycra for stretch and wicking. Some of you will know that I am a big fan of Injinji Toe Socks. There are many reasons but mostly because I have found them to be, for me, the most effective way to avoid toe blisters. These days, if I do get a blister its more a result of the shoes rather than how my feet sit in socks. Generally, traditional hiking socks squash up my feet – its probably more about the reaction of my feet when I put them inside anything – my toes in particular, decide they want to be close to each other. I don’t know why, its just what happens. So when I was asked to test Wilderness Wear Multi Sport Active Sock I was a bit nervous. Weaning myself off my toe socks for a few trial hikes was not appealing. To my surprise these socks worked well for me. I did have a bit of ‘squash toe’ syndrome happening but it wasn’t because the socks were too squashy – I just had to remind my toes to spread out! These socks are thicker than I am used to – they are cushiony on the soles but lighter on the top of the feet. They also have cushioning under the toes which actually helped to straighten my toes so they were separated instead of bunched up. These socks are very warm and cosy so will be great during the cooler months and suitable for any outdoor activity. I particularly like the double band at the top of the sock – it is broad so there’s no cutting in and firm enough to stay put. 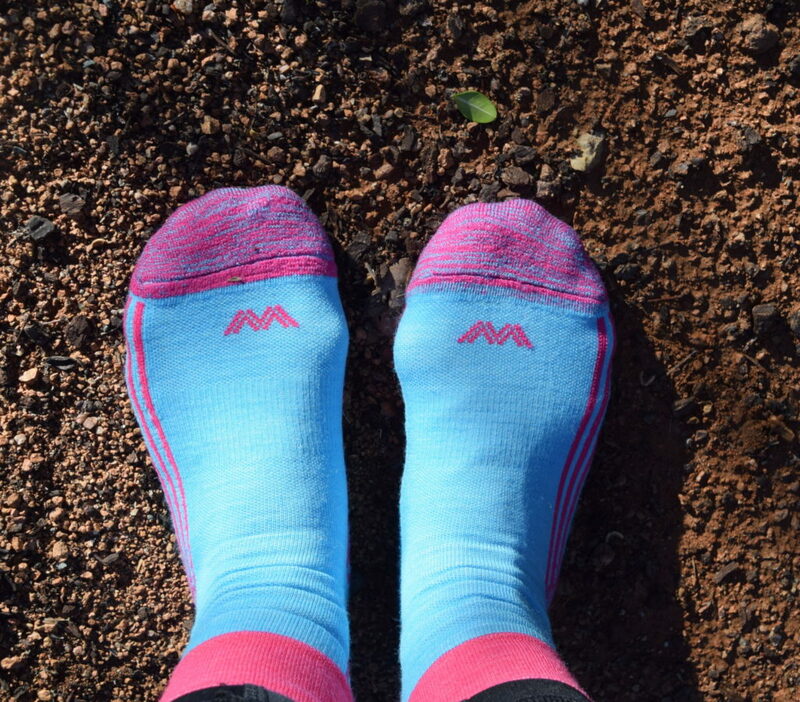 And these socks come in two colours Blue/pink or Charcoal/orange to add a bit of brightness to your day. I tested the size 3-8 which were good even for a size nine foot. If I was going to be walking multi days, I would opt for the size 7-11. These socks feels soft on and are super easy care – anything that can be tumbled dried is good by me however if your sizing is borderline, you might want to think about going up a size particularly if you are an avid tumble drier user! I will continue to include these socks in my hiking rotation and recommend them to anyone looking for a durable and soft hiking sock.